"Gonpachi Komurasaki" was premiered in the 1st lunar month of 1816 in Edo at the Nakamuraza as the first and second acts of the nibanme of the sogamono "Hiyoku no Chô Haru no Soga Giku" [more details]. This new year drama mixed two sekai: it was a sogamono and a gonpachi-komurasakimono. "Gonge" is the nickname of the second act. The accompanying music, performed in the Kiyomoto style, "Gonge" is the nickname of the first act. Gon came from Gonpachi, the first name of the hero. Ge came from shita no maki, which means the lower (shita; ge is another possible reading) volume (maki), aka the second act. became famous and its own title, "Sono Kouta Yume mo Yoshiwara", quickly became the title of these two acts, which were kept in the Kabuki repertoire. The others acts related to the vendetta of the Soga brothers fell into oblivion. 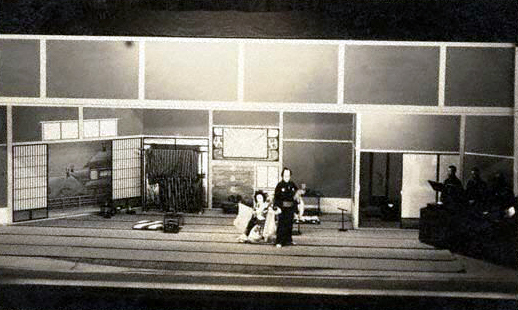 Shirai Gonpachi is in Komurasaki's room at the Miuraya, a famous ageya in the pleasure quarter of Shin-Yoshiwara, playing his bamboo shakuhachi to the accompaniment of Komurasaki's koto. Suddenly, one of the strings on the koto snaps and this is traditionally a bad omen. Gonpachi, remembering his frightening dream , cannot help feeling perturbed. Shirobê, the proprietor of the Miuraya, who is sympathetic to the lovers, comes to the room. Komurasaki quickly hides her lover in an adjoining room while she asks Shirobê what business it is that has brought him to her room. Shirobê answers that he is aware that Gonpachi comes often to meet her, but he has heard that he is wanted for murder and theft. He kindly warns Komurasaki of the danger in Gonpachi's frequenting her quarters, and hints that she must quickly send Gonpachi on his way so that he will not be caught by the law. Komurasaki thanks Shirobê for his consideration. The Miuraya proprietor is aware of the presence of Gonpachi in the next room and he makes his departure. Gonpachi, who has overheard Shirobê's words, dashes out in a frenzy. Komurasaki tells him that she has been more or less aware of the circumstances from the many rumors going around the quarters. Gonpachi says that his nightmare  will no doubt come true. Komurasaki promises him that she will remain true to her pledge and stay with him to death. But before fleeing together, it is necessary to change Gonpachi's appearance so that he will not be readily recognized. Komurasaki brings out her mirror and starts to arrange his hair in a different style so as to alter his appearance. She shaves off his front lock of hair (maegami). But even as she does so, torite rush into the room. Gonpachi comes in his flight in the dead of night to the Rokugô River where there is a small ferryboat. He calls into the boatman's shack to ask for passage across the river. But it turns out that the boatman is a torite in disguise. In a moment Gonpachi is surrounded by a group of torite, and rather than be taken and executed, he commits suicide by self-disembowelment (seppuku).